OK, remember this layout? I liked it and wanted to use it again... 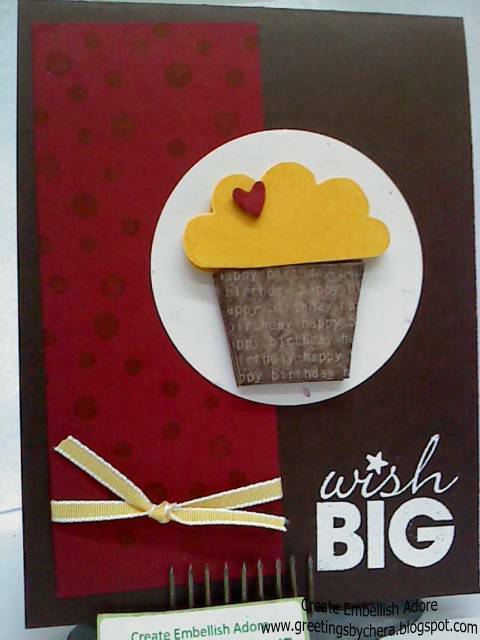 I had hoped that I would have received the Build a Cupcake punch (2011 Occasions Mini), I haven't so I had to make due with a retired set (Big Bold Birthday). I counted on my handy little Creative Coach Color - to give me a the Daffodil to go with the Cherry Cobbler and Espresso I had out since I should have been preparing Valentines I love the Espresso with Cherry Chobbler.. its like CHOCOLATE CHERRIES!... YUMMY! Stamped three images, cut three images, put them together with dimensionals. Hugs the ones you love! 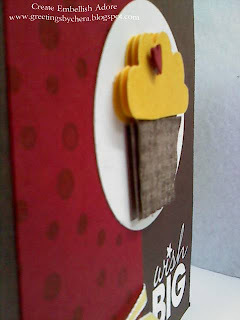 Love the colors and the "popped up" cupcake! Yummmy!